This is a translated version of part of Taut’s “Die Städtkrone” (originally appeared in 1. Aufl. – Jena: verlegt bei Eugen Diederichs (1919); with 72 Illustrations). The images posted on Socks correspond to the selection made by the translators of the article. For the full text by Bruno Taut , with contributions by Paul Scheerbart, Erich Baron, Adolf Behne and all the illustrations: read the original German version here. In the early part of the 20th century, Bruno Taut developed an urban concept for the planning and reconfiguration of European cities to overcome national and social differences by means of architecture. A communal center modeled after the medieval cathedral or temple crowned Taut’s city. 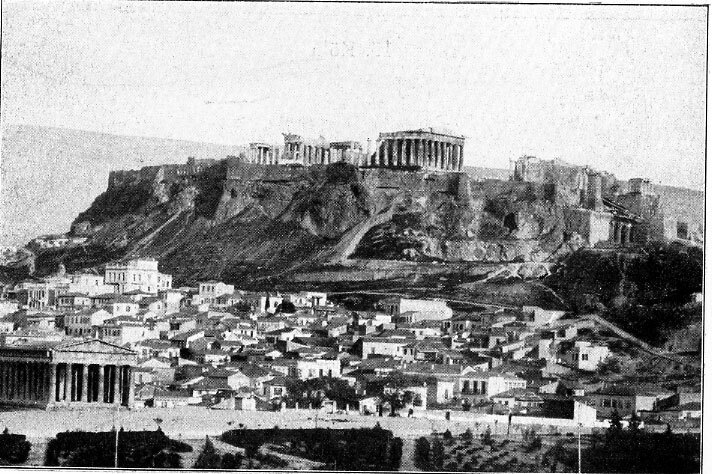 In his anthology Die Stadtkrone (The City Crown) (1919), a critical text for the history of European Modernism, Taut championed the use of individual structures to define and affect the planning of an entire city.1 Taut’s anthology encouraged young architects to envision and build the ideal rather than perpetuate the quotidian. This first English translation of The City Crown maintains Taut’s original goal. Many thousand times shall be praised the glory of architecture! Mankind cannot face the forces of nature without shelter. [Shelter] fulfills his need for protection from inclement weather and the manifold dangers to which he is exposed.² In this way, the role of architecture for mankind as a ”functional art” seems to be a modest one, which satisfies his practical demands in a graceful way. Only when human desire goes beyond the satisfaction of mere functional needs, where people desire an abundance of luxury, does [architecture] seem to be more noticeable and reveal more of itself. In these instances, [architecture] is not constrained by the satisfaction of bare necessities and for that reason presents itself as a form of art. Overall, the public, and those who serve architecture, confront it with this point of view today.3 However, architects still do not need to complain. It is already a great accomplishment to fulfill people’s recurring and increasing needs. Humanity cannot be nourished without forms that stand in the purest unison with their purposes and, by their inner veracity, purify and support the entire culture. Because it is here, even if only to a modest extent, already a question about [metaphysical] forms, meaning creations of the imagination, so the imagination’s meaning and value must emerge even more strongly when luxury becomes the driving force and function is no longer a limiting factor.4 In this way, [design] is no longer concerned with the unity of form with purpose, because the play of form now serves to increase the enjoyment of life. Rather, [design] is about [the] unity [of form] with a purpose greater than basic needs. It becomes apparent that the conception of architecture and the true vocation of the architect are taken too narrowly. Like every other art, architecture must ground itself in the entire being of mankind, including all that through which he perceives his own value and relation to the world. 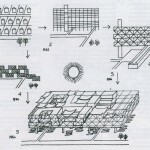 Because the abstraction of [architectural] form is given by its nature, it is sometimes mistakenly compared with music. Therefore, the visible core from which [architecture] emerges must be especially clear and strong. It can reproduce, only negligibly, the variable tempers of its creator as lyrically as music. What in stone extends for centuries into the heavens, as a monument of the human spirit, must be based on a broad and strong perception. Although one individual may be its spiritual creator, a building needs many hands and material means for its construction. The architect must carry within himself an awareness and knowledge of all the deep feelings and sentiments for which he wants to build. Of course, his work aspires not only to the ephemeral, in that it calls to the Zeitgeist, but also to those dormant spiritual forces of generations, cloaked in beliefs and aspirations. At first, it appears necessary to solve tasks based solely on need. Yet, in reality, it is not practical demands, but rather the imagination, that creates architecture.7 This shows that the will of the building artist is directed by something entirely different from a specific purpose and that this will lies above and beyond mere functionality. Buildings that exhibit a minimal practical purpose or none at all best demonstrate an architect’s volition. Throughout every great cultural epoch, the constructive will of the time was directed at one ulterior, metaphysical building [type]. The narrow concept of building construction applied today is a complete inversion of what it was in the past. A minster, a cathedral above a historic city; a pagoda above the huts of Indians; the enormous temple district in the square of the Chinese city; and the Acropolis above the simple houses of an ancient city – all show that the climax, the ultimate, is a crystallized religious conception. This is, at once, the starting point and the final goal for all architecture (Figures 1-4). Its light, radiating onto each building, down to the simplest hut, demonstrates that [buildings] can fulfill the simplest practical needs and still possess a shimmer of such a conception’s glory. The depth and power of this view of life is not limited to large buildings alone; intensity and passion create beauty in the small as well. Embedded within the task of the architect, this alone achieves the right valuation of scale and prevents the blurring of boundaries through which our times suffer between the big and the small, the sacred and the profane. During the gothic era, this philosophy inspired the incredible adventurousness of the cathedrals and produced the restless interpenetration of the practical and constructive needs of the people in the simplest of buildings. The fabric of the old city is a precise image of the inner structure of man and his thoughts. It is so obvious that [in the city] we can see in front of us everything that humans felt connected to by their innermost being: an architecture of the spirit. Altogether, huts, dwellings, and town halls cultivate and culminate in a cathedral, temple, or something that one could call a great architecture, a single building. Beyond the actual construction, the cohesion of this fabric is so tight that it embraces and unifies the qualities of mankind, their enjoyment of life, their world-views, and all forms of art. Architecture flows through all being and this, in itself turns it into architecture. Can architecture and its meaning ever be overappreciated? It is a carrier, expression, and touchstone for every period. We need not study cultural history, the particulars of everyday life, or the political and religious doctrines of different epochs to clearly see in the stony witnesses what has fulfilled humanity. Because it connects generations, architecture represents a second life for man; it is the truest mirror. It declares what long-deceased prophets have learned and ruling families have believed.8 For this reason it seems that the phrase ”building art” is too limited for something that has become life, and worlds of thought, rendered in stone. The mirror of the old city image is true, pure, and unclouded. The greatest buildings were derived from the highest thoughts: faith, God, and religion. The house of God governs every village and small city just as the cathedral reigns majestically over large cities. This is quite different from what we see today in the housing developments that extend beyond the old city plan. That it was a religious thought that created the majesty of these edifices needs no explanation. The often-lofty position of fortifications and castles share no commonalities with [religious architecture], chosen to satisfy the practical need for fortified protection, a value no longer held in today’s warfare. The cathedral, with its truly inappropriate nave and even less practical tower (purpose as a basic need), remains the actual city crown. Despite the strong political independence of the old city, the town halls, civic buildings, guild houses, and so many others subordinate their beauty and glory [to the cathedral], as do the multicolored jewels that surround a sparkling diamond. In them rests everything, which should represent the highest of ideas: the towered city walls, the chain of gabled houses that enclose the city hall, small church towers, and finally the main church. Together, these elements build a closed, increasingly heightened rhythm that culminates precisely at the top. In the wealth of its overflowing life, the component parts may not always be recognized so clearly, but [the city’s] inherent organization is apparent. A religiousclerical presence alone cannot explain this aspiration, because it was the result of deeper religious needs. No matter how you try to explain this phenomenon, whether or not it was intentional and in the consciousness of the old masters, it exists and is inseparable from our conception of the old and beautiful city.9 The same presence is found in the distant past, and yes, even more prominent in the impressive temple systems of antiquity or in the temples and pagodas of Asia, where the removal of fortification walls often evoke an even more powerful contrast to the simple dwellings of common people. Angkor-Vat (from Fergusson, History of Indian Architecture). Without any particular justification, one perceives the image of the old city as a grown organism. Although the particularities of different localities resulted in numerous variations, what essentially remains the same is that the city developed around the cathedral and the city hall. It then grew outward towards the city walls that were originally located very far from the center so that, in the case of a siege, the rural population could flee inside. How [the city] must now transform itself when the intoxicating effect of the economic boom brings about an increase of traffic by the train! Tenement buildings, factories, and office buildings glued themselves onto the old core and, despite the mammoth scale of the expansion, threatened to smother what still remains of the true center. Because a combination of old and new was no longer possible, conceptions of city planning were rife with uncertainty [and] confusion. Finally, after too much time had elapsed, one perceived the instability of the city as a chaotic condition. It appeared impossible to clean such an Augean stable of cultureless-ness.10 The neglect of all fundamental concepts of building and planning had gained too much power.11 ”The paradise, the home of art” vanished and had become ”the hell, the home of the power hungry” (Scheerbart).12 Cities so transformed certainly stood in the most beautiful harmony with their being, that according to the laws of nature, always provokes a unity of content and form. Even the filthiest tenement quarters, yes every single house, always stands in harmony with the life that goes on inside of it, no matter how ugly it is. Moreover, if a divinity arrived and suddenly deposited the most beautiful quarters, after some time, life in such new houses would be directed to it. Nevertheless, given the state of the chaos, it would really require a God. The few people that perceived the hopelessness and ugliness of this materialistic existence could only slowly dig and search for a new order of things by departing from individual points of view. At first, people were entrenched in a romantic love for the beauty of the old city image and sought, through the study of the single street and square forms, a new aesthetic orientation (Camillo Sitte).13 In addition, research was conducted on a new basis of urban planning according to social, economic and health issues. The goal was to organize the city quarters and street lines, as well as to discover everything upon which a new city could be built in the first place (Theodor Goecke).14 This line of thinking formed a new theory called ”urbanism.” However, in large part, it remained until today only understood in formalistic terms because many of its followers could only view it superficially. In substance though, [this new theory] turned out to be a fertile seed for the future. One after another, all the good powers were carried away by [the doctrines of urbanism]. Owing to many designs and theoretical studies, today we have an idea as to how best organize a modern city. 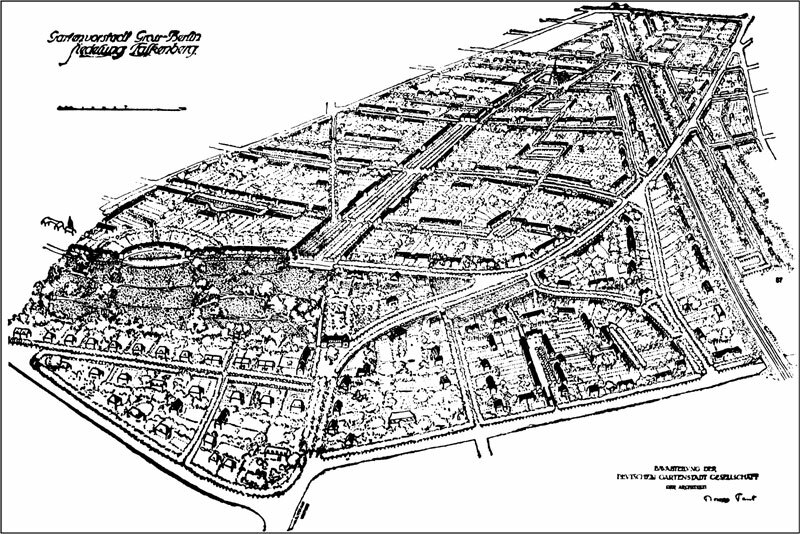 Although often obscured by compromises, a new idea lives in the garden city movement, the fruitful urban planning of existing city expansions and their improvements. A new idea directs all these heads and hands; it is the idea of a new city. A deep desire directs us all: we want cities again, in which we can, according to Aristotle, not only live safely and healthily but also happily. This longing rests so deep in our psyche that we have no need to look back to the old. With pride, we know our own wishes and inclinations that differ entirely from those of the past. We endeavor to fill them with hope, undeviated by all inhibitions. 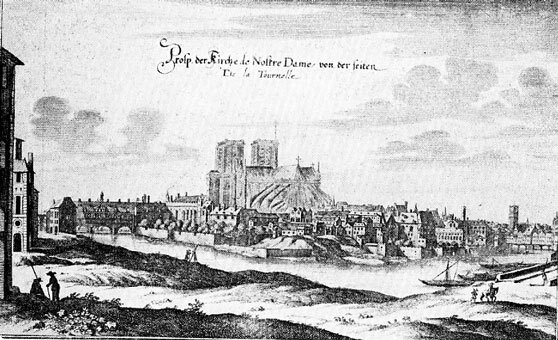 Paris, France from Zeiler-Merian, Topographia. This idea of the new city will bear fruit and we shall be happy that we have it. It is for us the secure promise that our descendents will live better and more beautifully. Yet, one idea must be made clear in our minds: organizing – restructuring – organizing – restructuring. This should not be underestimated; yet, is this an idea that one can build? Has this in itself a building force?18 Where lies the graphic image without which there is no art? What image do we have of the new city? Healthy apartments, gardens, parks, nice paths, industry, businesses – everything healthy, wellordered and comfortable for living. A school here, an administration building there, all laid out beautifully in a romantic or classical style. Yet, can all of our life’s needs be fulfilled by comfort, ease, and pleasantness? The whole can dissolve like snow in the sun. Is there no head? Has this torso no head? Is this our image, our spiritual condition? We look at the old cities and must say wearily: we have no [firm] footing. We have civic buildings: schools, baths, libraries, city administration [buildings], etc.! And these edifices can certainly dominate! Still, for practical reasons, a number of these buildings, including the schools, baths and libraries (with the exception of the main library) lie scattered about our comfortable city to disburse their healing effects. Nevertheless, an administration building located in the urban center can dominate as the city hall once did! Despite being a pure representation of the government, the city hall certainly was subordinate [to the cathedral]. Our city halls comprise only offices for civic administration. Citizens arrive, register, pay taxes or fines, and leave. Moreover, [the city hall] probably contains the city council assembly room, meeting rooms and other [spaces]; but does this [type of structure] represent our view of life so that it may reign powerfully above the entire city? Justifiably, the opulent endowment of modern city halls with a tower and heavy architecture is rejected for reasons of parsimony, because it contradicts the building’s inner workings.19 Cities today probably have their own independent administration, but they are not as self-important and powerful as were those of old [free] imperial cities. Even then, a city was not built around the city hall. Hence, to grant today’s city administration [building] equal significance is foreign to our modern feeling, particularly in regards to the state. Rappaport continues to suggest that, as long as the state does not acquire the land in a timely manner, building codes and development plans remain the right of the city community, which thereafter also has the right to the distribution of these buildings in the city space. The movement of government buildings into the periphery of the city is [comparable to] a Landflucht (migration of the people from the land). Therefore, it seems here that outer form and inner content are completely overlapping; we must search for another head for the torso. 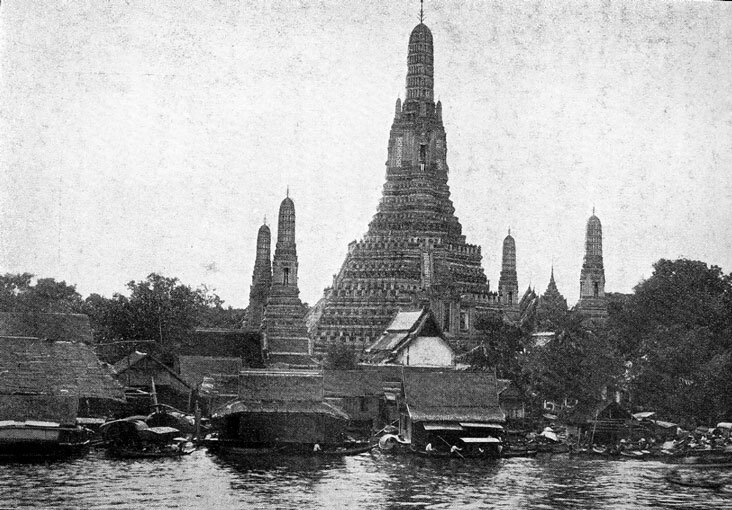 Bangkok, Siam (Thailand), the Great Wat Tsching Pagoda (from the collection Mappenwerk für Einzelblätter, Library of the Museum for Arts and Crafts, Berlin, Germany). Still today, it must be as it was in former times, when the highest structure in the cityscape was a religious building representing a crown of the city. For all times, we have gravitated to the house of God as the one building that can convey our deepest feelings about mankind and the world. Nevertheless, despite his desire to create something to unite the longing and hopes of people in community, his project proposal received no support. The church is missing in the contemporary conception of the city. Although churches are designated in plans, they are distributed in such a way that they do not find a superior meaning [in the cityscape]. 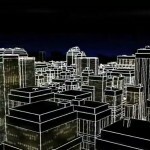 Furthermore, as with the church, the idea of God is lost in the new city. This is not to claim that religious life has diminished in its intimacy, but rather that it has been dissolved in smaller and smaller channels. The common prayer and liturgy have lost their unifying power. It is as if people are ashamed to openly admit to their religious beliefs, as if spirituality has withdrawn to the quiet chamber of the individual. The church follows the same process [of becoming] decentralized [and] split up, [with] its spiritual shepherding delegated to missionaries. Pious communities with prayer houses in city quarters, as well as small churches scattered about [the city], illustrate how the church associates itself with the general appearance of dissolving. Even the clergy of the Catholic Church, so proud of showing itself, follows [the appearance of dissolving]. The large old cathedrals remain full of life as it stems from tradition. However, while the care of souls [continues to] follow similar customs today, there are no new cathedrals. Apparently, religious confession no longer has its former strength. No confessors, no fighters argue for it, and what in the past had inspired large movements, has been stripped of its dogma today, limited to the individual and seized by a complete metamorphosis. However, faith certainly still exists. It is not possible that millions of people have declined completely into materialism and live without some personal view of why they exist. Some form of purpose must live in every human breast, a feeling that lifts the individual beyond a single temporal space and allows them to feel community with their contemporaries, their nation, fellow humans and the entire world. Where does it lie? Does a deeper meaning of life also melt away or is it something flowing through all people waiting for its resurrection, for its radiating transfiguration and crystallization in magnificent buildings? Without religion, there is no true culture and no art. Are we to be divided into separate streams, to vegetate without creating for ourselves the true beauty of life? Both the poor and rich follow a word that resonates everywhere and promises a new form of Christianity: Socialism.28 It is the urge to somehow enhance the well-being of mankind, to achieve salvation for self and others and to feel as one, solidly united with all mankind. This feeling lives, or at least slumbers, in all mankind. Socialism, in its non-political sense, means freedom from every form of authority as a simple, ordinary connection between people and it bridges any gap between fighting classes and nations to unite humanity. If one philosophy can crown the city of today, it is an expression of these thoughts. If the architect does not want to become unnecessary, and if he wants to know the purpose of his life, he will have to design [the crown of the city]. Furthermore, if we do not know the great element that feeds all small waters, we will not know the reason to make this little house or that building beautiful! As explained in the beginning of this essay, the lack of this knowledge is the reason why architecture is so poorly appreciated today. But [architects] themselves are responsible for this. If they have no ultimate vision, if they do not hope and long for the greatest achievements, then their existence has no value. As a result, an architect’s talent is wasted in economic struggles and is squandered upon small aesthetic things or the over-valuation of trivialities. Rather, [architects] must exhaust themselves upon the glorification of the old, and the eclectic or conceptual speculation of the new, such as local art, function, material, proportion, space, surface, and line amongst others. Ultimately, [architects] are entirely incapable of creating something beautiful, because they have divorced themselves from the last inexhaustible welling up source of beauty. Studying old building styles does little to help [the designer], because, like this, they only glue themselves to individual forms and become blind to the light that radiates through all beautiful individual things. The architect must remind himself of his high priest-like, godly profession and try to awaken the treasure that sleeps in the depths of the human mind. In complete self-abandonment, he must steep himself in the soul of the human population and find himself and his high profession by giving – at least as a goal – a material expression to what slumbers in all mankind. As it was at one time, a talismanic built ideal should again arise and make people aware that they are members of a great architecture. In this way, color can finally flower again, the colorful architecture, which is desired by only a few today. The scale of pure unbroken colors can pour out over our houses and save them from their dead grey on grey. And the love for glamor awakens: the architect is no longer afraid of the bright and shiny. He again knows how to use it and from his new position, far away from all prejudice, can distribute new effects to all things. If it is now really socialism that yearns for the light but still rests buried under the surface, is it possible to create something that is hidden? The answer is in the cathedrals. These great temples were previously not there and their thought was once born in the head of a single architect. What stands there proudly and self-evidently today, was at one time introduced as an idea and it was planned when the desire for it still lay locked in an undefined and unclear vision within the soul of the people. Certainly, one will say that there were humble beginnings and uncertain trials, but step by step the large cathedral grew, as a consequence of tradition, that was always made the same, until it boldly arose as the result of a long exercise. I am convinced that already in the smallest beginnings, this idea or inclination existed, since it is a human construction. However, the result was incomprehensible. For example, today the people of India attribute the edification of the Wonder Temple to the Gods, even though for a very large temple system like Ankor Vat (Figure 2) the name of the architect (Diwakara) has been handed down through the centuries. Have we not also such beginnings? From nothing, nothing grows, and architecture only arises if it emerges from a story. It is not possible to allow a simple thought to become architecture without a story. It is for this reason that all modern attempts to create a monument are condemned to unfruitfulness, because there is no event or tradition on which to build. The structure is founded upon the external imitation of misunderstood old works. In the past, the religious process in the temple such as the offering, mass, etc. 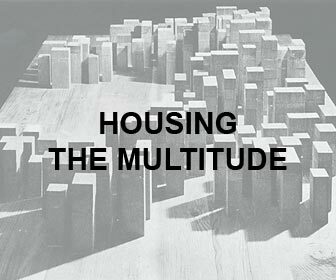 was necessary to define the nature of the buildings. If the city crown is embedded in socialist ideals, we must examine the types of actions which manifest these ideals today. What do the majority of people want today? What do they do? Are there no events in which the longing of the masses expresses itself in a veiled form? Let us follow the crowd to the places where they spend their leisure away from material wishes. We then come to these places of enjoyment, from cinema to the theater, or to the people’s assembly houses that they are drawn to by a political longing or the wish to sense their community. Here, we find two motivating forces that already have called to life numerous buildings: pleasure and the community. These instincts have been detected by leaders29 and with some luck have been brought to perfection. The desire for amusement, that moves large numbers of people into theaters (according to news reports, in Brussels the number of theater visitors every day is approximately 20,000 in a city of nearly 600,000 inhabitants), should not be interpreted as a raw drive for amusement. Rather, in it sits the cry of the soul for something higher, for the elevation above everyday existence. Performers view the German theater visitors as particularly grateful and devotional guests, who attend the theater with Sunday-like sentiment. The other side of the drive that leads people to community events possesses a noble inner character as well. It is their longing to educate themselves through the community, and to feel as one with their contemporaries as a human amongst humans. Obviously, underlying these activities are the ethics of the people that have created numerous buildings many of which are opulent (the Volksbühne in Berlin) and nice (Diamond Worker Union House in The Hague).30 Still, one has to unite the different forms of architecture so they do not get lost in the political structure of the city. Obviously, a single great homogeneous movement embodies this tendency and embraces all the public parts in the broadest and strongest way. In this lies veiled the yearning of our time that wants to come to the light and seeks a visible transfiguration. This is the building desire of our world. The idea of a new city has been born, but it is a city without a head. However, now we know what its head or its crown must be. The design explained below is an experiment to show how in a new city, the crown, the highest, could be achieved. This proposal may seem adventurous and even pretentious, but at the risk of being chided as immodest and utopian, it must be made at least once. It should merely clarify in a concrete form the tendencies that encourage one to build high and should not be looked at as an end in itself, but rather as a suggestion that brings us closer to the realization of what was identified previously and to the fulfillment of further aims. To begin with, what is crowned must be discussed, the city [itself]. 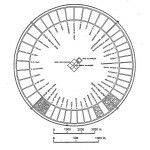 A schema is presented here according to which a new city should be laid out in the plains (Figure 11). To recognize the idea and the theory as purely as possible, all particular charms that a preferred location would bring are deliberately excluded, such as the sea, a river or mountains. In reality, the entire city would look much more differentiated by all these things without lacking such a schema, similar to an old city that clearly reveals its design. A circle with a diameter of approximately seven kilometers encompasses the entire city and its ”city crown” is placed at the center. This crown is a rectangular area of 800 x 500 meters. It is tangent to the main road arteries, which for reasons of traffic and beauty do not run through its middle, but tangent to it and radiate in wide arcs from there. In a similar arc, the train line is planned in the eastern section of the city so that businesses can develop in between the train station and the city center. For practical reasons, administrative buildings, the city hall, and others are placed around special squares within this quarter. Furthermore, factories are placed to the east, along the train line going out beyond the periphery [of the city], in order to spare the city from their emissions. In the west, along the main wind direction, a big sector shaped park brings good air from the woods and fields into the city. [This park] connects the heart of the city with the open land like a lifeline. This will be a true people’s park with playgrounds, grass play areas, water tanks, a botanical garden, flower beds, rose gardens, a vast grove and a forest leading to a natural area. Axial to the city center, three main churches and schools lie scattered in the living quarters. In the middle of the park, the classroom centers (university) are positioned and, further outside, the hospitals. As shortcuts, two main street lines lead diagonally to the train station. In the residential quarters, streets mainly run from north to south, to provide the front of the houses on both east and west sides with sunlight as well as windless streets and gardens. The houses are entirely conceived in the character of a garden city; in low single rows with deep gardens for every house, such as that of Figures 13 and 14, so that the residential area itself is a horticultural zone making allotment gardens unnecessary. Beyond the periphery of the park belt is the agricultural zone. The entire surface area of the city occupies 38.5 square kilometers and the residential zone approximately 20 square kilometers. This garden city type of development allows for 300,000 inhabitants, or 150 souls per acre, with the possibility of expansion up to 500,000 inhabitants. [Although] green areas, playgrounds and park strips are intermingled in between residential and industrial areas to separate them, no further details are indicated. The distance from the periphery to the city center is not more than 3 kilometers = 1 ⁄ 2 hour walking time. The streets within the residential quarters themselves are as narrow as possible (5 to 8 meters) in order to not waste unnecessary resources. Thoroughfares are designed to accommodate streetcars and abundant car traffic. According to the principles of the garden city, the height of houses in residential quarters remains as low as possible. Business and administration buildings are allowed, at maximum, one floor above the houses. In this way, the city crown reigns powerfully and unreachably above the entire city. The city crown itself is a grouping of buildings situated to meet the social interests of the community and to fulfill their artistic and entertainment needs (Figures 5-11). Four large buildings that form a cross crown the city. Oriented strictly towards the sun, these structures include the opera, theater house, a large community center, and a [large] and small meeting hall. Their exits face in four different directions to allow for a quick diffusion of the masses. Open squares are located on each side in case of an emergency. A court with wings is located in the middle for scenery storage, supplies, janitor rooms, etc. These rooms are connected and surrounded by a colonnade. On the four corners, to the left and right of the community center, are meeting houses with terrace gardens for small intimate events (e.g., weddings) with aquariums [on one side] and green houses on the other. This gallery enables the intensive use of the entire area. An afternoon can be spent in the terrace garden, and a concert, theater or meeting can be attended in the evening. 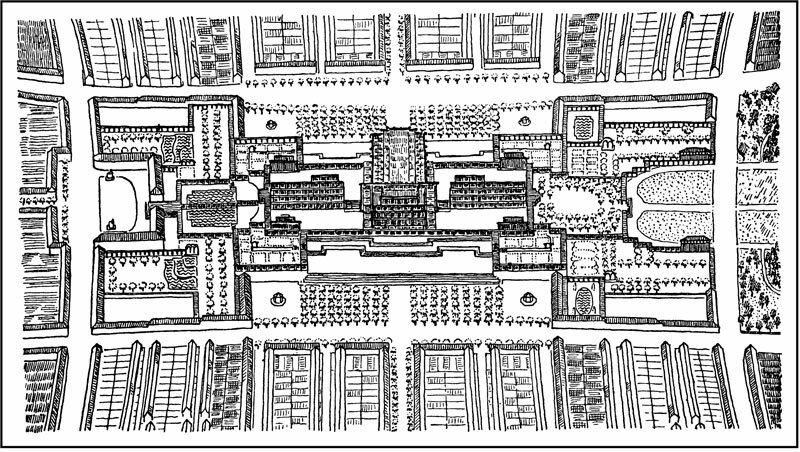 While the exits from the theater and small community center lead to large outside staircases (special ramps are not drawn; the approach to the loading dock in the middle would take place via a tunnel-like driveway) and tree-covered squares, on the right and left of these two large buildings is a framework of courtyards, arcades and buildings, which vary depending on position and purpose. The opera house is a companion to the aquarium and greenhouse, providing the quiet beauty of fish, flowers, exquisite plants, and birds. As a dignified conclusion or beginning to an evening of art, a covered colonnade with stairs leads across an enclosed and equally arcaded pond to the car parking area. The museum and central library are attached to the outer square. These are serious buildings with two upper floors that are not too large. In the new city, mass storage of anything that’s old and all sorts of questionable new things does not take place, as today’s museums unfortunately exhibit in abundance. 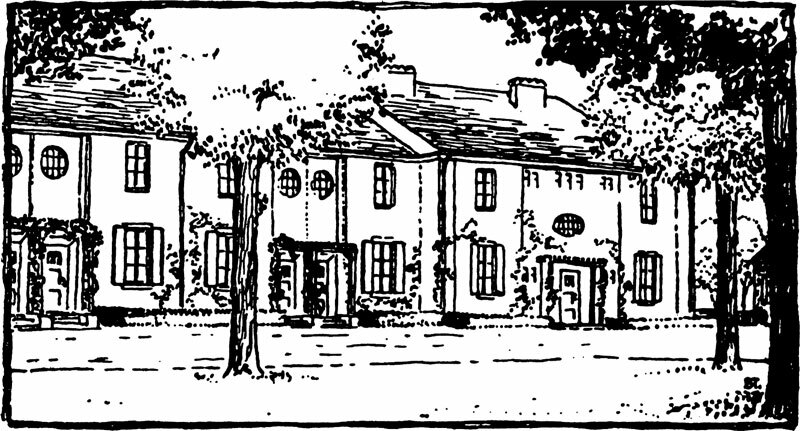 Two reading houses, connected to the museum and library by colonnades, stand in gardens at cascade ponds. These [gardens] are connected to those of cafes and restaurants. The outermost corners should contain consumer and department stores, which are [operated] based on socioeconomic criteria. Similar to the restaurants and cafes, they have only one upper floor, so that they lead up to the living houses. Each [store] has special loading docks. The two western corners of the [central] area are the same, but the forecourts and gardens are different from the eastern side according to their varying purposes. Directly in front of the large assembly hall or community center is an enclosed arcade of trees, which defines a square for public assemblies. A speaker can conduct open-air meetings from a pulpit in front of an exterior staircase, with a crowd gathered on a large sloping lawn. This lawn continues across the road into the city park, and up to a lake with water fountains. To the right and left of the lawn are a summer theater and a garden restaurant. Beyond this space, graceful amusement devices can be added in the park, something in the 7 style of Tivoli in Copenhagen. 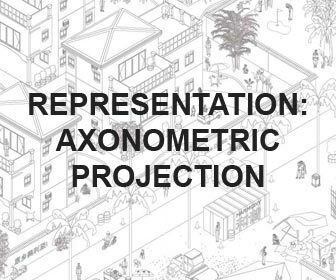 The entire [city] decreases in importance from above to below, similar to the way humans are differentiated from one another in their tendencies and by their nature. The architecture crystallizes this image of human stratification. The entire city is accessible to everyone; and people go to where they are drawn. There are no conflicts, because [people with] the same tempers always congregate together. The upper crown is visible by the symbolic form of a cross, expressed by the masses of the four large buildings. The socially directed hopes of people find their fulfillment at the top [of the edifice]. The drama and the play of music provide a unified people their inner momentum, a drive they long for in their everyday life. Their reunion in community centers enables them to feel what they have to give to one another as humans. This leads the herd instinct, the elementary power of amalgamation, to its most refined statement. Because of their position and arrangement, the buildings must become as living organisms on both the inside and outside that only exist in this special life. In theaters, the gap between the stage and seating and between the actors and the audience no longer exists. The dramatic indulgence of the audience is no longer a purchased commodity that remains closed behind an ”iron curtain” before the purchase of the ticket. The curtain is no longer separating; it is a meaningful artistic tool, a tight ribbon encircling actor and audience. A festive counter-play in light and color between stage and theater, built and decorated according to the scale of each individual person, creates the framework for dramatic experiences. A bare unstructured wall has no place here. This unique interaction vibrates throughout the building and enlivens all its single members, emanating from the stage above the theater, from the corridors and foyers to the external architecture. The community halls have a similar full harmonic tone of human community. Spirit and soul should be lifted in them and mature to give the whole its beauty. Large and small halls for reunions, lectures, concerts and parties; the auditorium, library and reading room; entertainment and playroom; corridors and every part of the community center depict the domestic intimacy surmounting architectural design, which is based entirely on the large community and unites itself with sculptural and painterly decoration. This design goes beyond the barriers of the everyday, the ”natural.” It flows freely and, at the same time, in a tight spiritual bond. The cross configuration that is derived from these four large structures is the upper crowning of the entire building group. However, this building mass is itself not yet the crown. It is only the base for an even higher structure, which is entirely void of purpose. It reigns above the whole as pure architecture. 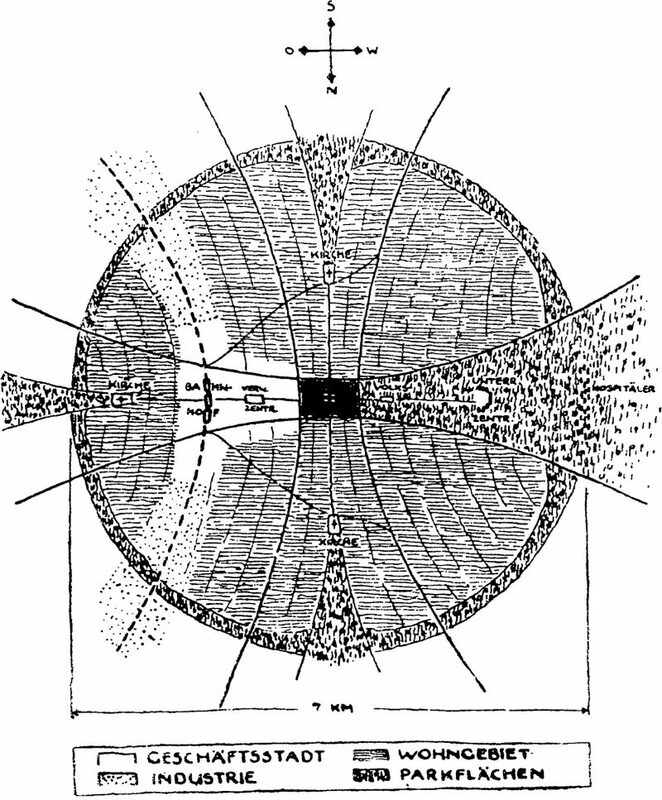 It is a crystal house constructed of glass (Figure 12). [Glass is chosen as] the building material, because – due to its gleaming, transparent, reflective character – it is more than ordinary matter. An iron-concrete construction lifts it above the volume of the four large buildings, which forms its framework. Between them, the entire rich scale of the architecture hangs resplendent in prismatic glass fillings, colors and colored glass mosaics. The crown contains nothing but a wonderful room, which is reached by stairs and bridges from the right and left of a playhouse and small community centers.32 But, how should one, even if only allusively, describe what one can only build! All deep and great feelings are awakened, as full sunlight showers in a high room and splits into numerous fine reflections or when the evening sun fills the upper vault and its red light deepens the rich chromaticity of the glass images and the sculptural work. Here architecture again renews its beautiful bond with sculpture and painting. It will all be one work, in which the performance of the architect is found in his conception of the entirety, of the painter through images on glass that are removed but also inspired by the world, and the [performance] of the sculptor is inseparable from the whole. Thus all [art] is connected. Everything becomes a part of the great building art, the noble desire to create that fulfills all artists equally and compels them to the highest achievements.33 Cosmic transcendental thoughts mirror the colors of the painter, ”world regions,” and a new sculptural form decorate all architectural elements, settings, connections, supports, brackets and so on. It shows that sculpture can again be something more than just figures in stone or masonry. It shall awaken again and expose to all its exquisite, until now step-motherly deprived richness. The entire world of forms is free from the spell of reality. What in waves, clouds, mountains, in all elements and creatures leads the soul of the artist far beyond what is figurative and natural stands again to shine and shimmer in all colors and materials, metals, precious stones and glass in all positions and spaces, wherever the play of light and shadow provoke it. This room is not finished smoothly and enclosed with walls but of a harmony that is rich and perfect in rhythm. 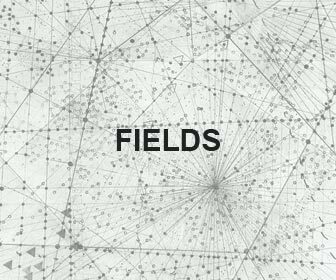 Great acoustically undisturbed music is heard from its galleries, a music that only serves the highest [and] is as far from the domestic as the visual arts. The light of the sun penetrates this crystal house, which reigns above the entire city like a sparkling diamond. [This house] sparkles in the sun as a sign of the highest serenity and peace of mind. In its space, the lonely wanderer discovers the pure bliss of the building art. While climbing up the stairs to the upper platform, he looks to the city at his feet and beyond to the sun rising and setting, towards which this city and its heart are so strongly directed. ”Light wants to pass through the universe and is alive in the crystal.”34 Emanating from the infinite, it is captured in the highest point of the city. It scatters and shines on the colored panels, edges, surfaces and concavities of the crystal house. This [house] becomes the carrier of cosmic feelings, a religiousness that reverently remains silent. It does not stand isolated, but is supported by buildings that serve the noble emotions of the people. These [buildings] are further separated in the forecourts by a more profane mechanism: realism and vitality surround the crystal, like annual markets and church fairs had once done in front of the church. The brilliance, the shining of the pure and the transcendental, shimmers above the festivity of the unbroken radiating colors. Like a sea of colors, the municipality spreads itself around [the crown], as a sign of the good fortune of new life. The ultimate is always quiet and empty. Master Eckhart said: ”I never want to ask God that he should sacrifice himself to me; I want to ask him to make me empty and pure. Because if I was empty and pure then God would have to sacrifice himself to me by his own nature and be determined by me.”35 The cathedral was the container of all the souls that prayed in this way; and it always remains empty and pure – it is ”dead.” The ultimate task of architecture is to be quiet and absolutely turned away from all daily rituals for all time. Here the scale of practical demands becomes silent, similar to the cathedral tower. Similar to the otherwise ”impractical” nave, the tower goes far beyond what this crystal house means compared to the many structures born of a higher purpose. Otherwise, everything else stands on a known and safe ground. When founding the city, the area will remain empty. 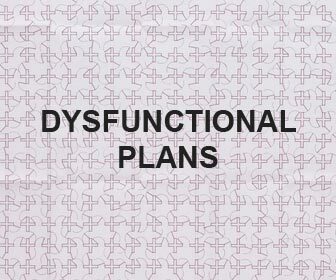 The necessities of the city are constructed one after another according to a fixed plan, until eventually the ultimate will be set up. Its construction can be passed on from generation to generation. The means to continue are contingent on the scale of progress, and the correlation between speed and demand will determine the harmony of the style. Many architects may build [the city], but success can only be achieved if they commit to the greater plan. There is a beauty in collaboration without knowing which blessed Brunelleschi will form the highest crown! The architectonic forms in this design should only be taken in a schematic way. The question of style is not a problem for us architects if we already know our aim. The city crown proposal in itself may be considered problematic. Perhaps with some justification – it may be that the solution of the city crown evolves differently. Nevertheless, enough will have happened, if [the architect] has given a modest effort to inspire the search in this direction. At best, this work should be a flag, an idea, or a theoretical suggestion, whose ultimate solution is comprised of many thousands of varied possibilities. 1. 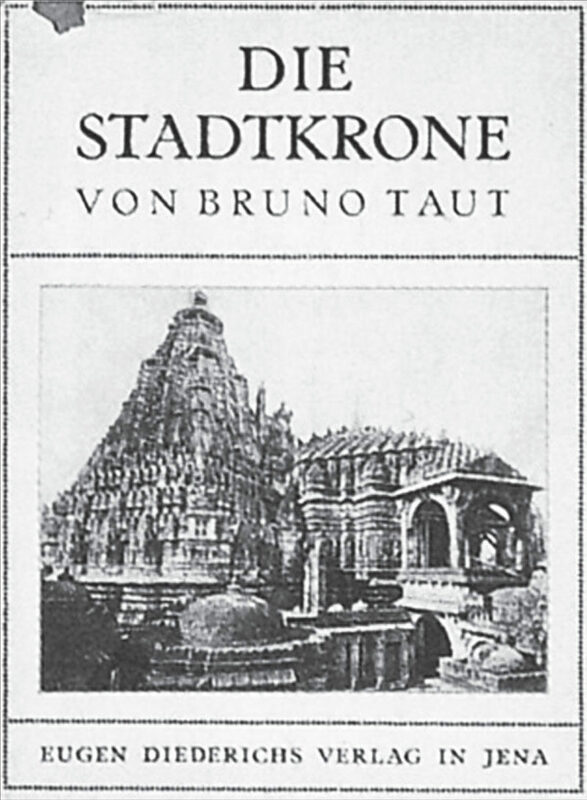 Bruno Taut, Die Stadtkrone (Jena: Diederichs Verlag, 1919), 50–76. 2. For this translation, we have decided to include the word ‘‘shelter’’ in brackets and use gendered pronouns in lieu of non-gendered language, to preserve the original character of the text and the culture in which it ,was written. Hereafter, words or phrases in brackets indicate additions we have made to our translation of the German text. 3. The term ‘‘those who serve it today’’ refers to architects as professionals who create architecture. From Taut’s perspective, architecture is perceived by the greater public as an art that goes beyond the fulfillment of functional needs and it is the architect who gives his life into the service of this art as artist. 5. The German word ‘‘Dasein’’ is in this text translated as ‘‘existence’’ when it is describing something physical and as ‘‘being’’ when describing something metaphysical. 6. Hermann Muthesius, Stilarchitektur und Baukunst: Wandlungen der Architektur im XIX. Jahrhundert und ihr heutiger Standpunkt (Jena: ,Diederichs, 1901). 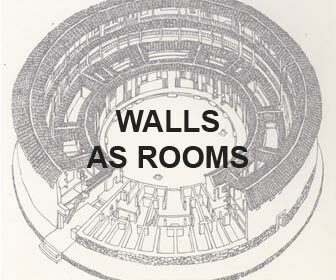 In English: Hermann Muthesius, Style-Architecture and Building-Art, trans. Stanford Anderson (Los Angeles: Getty Research Institute, 1994). 7. It is difficult to imagine that Le Corbusier’s claim that architecture is a ‘‘pure creation of the mind’’ in Toward an Architecture is not influenced by the distinction Taut makes here. See: Le Corbusier, ‘‘Architecture, Pure Creation of the Mind,’’ in Toward an Architecture, trans. John Goodman (Los Angeles: Getty Publications, 2007), pp. 231–51. The original printing of the essay as ‘‘Architecture III: Pure création de l’esprit’’ occurred in the tenth issue of Le Corbusier and Amédée Ozenfant’s periodical L’Esprit nouveau. Le Corbusier-Saugnier, ‘‘Architecture: Pure création de l’esprit,’’ L’Esprit nouveau, Revue internationale illustrée de l’activité contemporaine, no. 16 (May 1922): 1903–20. 8. A life that goes beyond the lifetime of a generation, a heritage that lives on. 9. Here, the term ‘‘Meister’’ refers to ‘‘Baumeister’’ (master builder). 10. In Greek mythology, the fifth labor of Hercules was the cleaning of the stables of Augeas, the King of Elis, in one single day. Owning the greatest number of cattle in Greece, the king had neglected his stables, which had , never been cleaned. Hercules succeeded in cleaning the stables by rerouting two rivers and thus washing out all the dirt. 11. The fundamental rules of urban planning were no longer considered and uncontrolled building had occurred, creating chaos in the cities that Taut considered unbearable. 12. Taut is referring here to Paul Scheerbart’s book: Paul Scheerbart, Das Paradies: Die Heimat der Kunst (Berlin: Commissions Verlag von George und Fiedler, 1889). 13. Camillo Sitte, Der Städte-Bau nach seinen künstlerischen Grundsätzen (Wien: Carl Graeser, 1900). 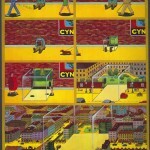 In English: City Planning According to Artistic Principles, trans. George Roseborough Collins and Christiane Crasemann Collins (London: Phaidon Press, 1965). 14. Theodor Goecke was professor for urban planning at the Technische Hochschule Charlottenburg in Berlin where Bruno Taut delivered his lectures in 1908. 15. Here, and throughout the text, we translate the word ‘‘disziplinieren’’ meaning literally ‘‘to discipline’’ as ‘‘to restructure’’, when it is being used to refer to an existing city that will be trained, or restructured, according to a new set of ideas or rules. 16. 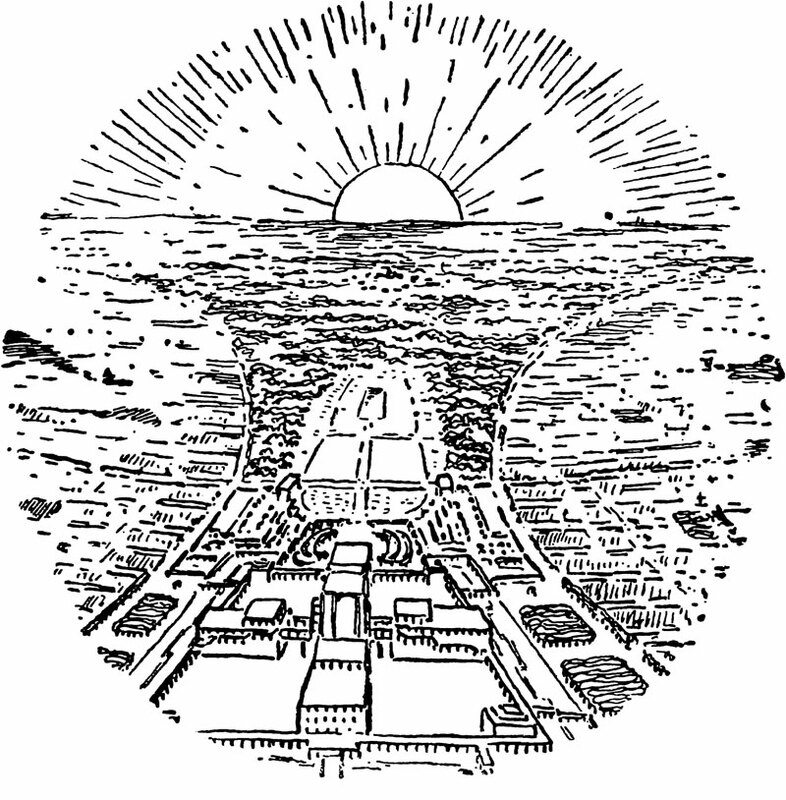 Ebenezer Howard, Garden Cities of To-Morrow (London, 1902). The German translation was first published under the title Gartenstädte in Sicht (Jena, 1907) and inspired the German Garden City Movement. 17. Taut is probably referring to the first German garden city, Hellerau, begun in 1909 just north of Dresden. 18. Taut uses the term ‘‘bauende Kraft’’ (building force). In this paragraph, he questions whether the idea of organizing and restructuring cities would alone be forceful enough to inspire architecture. 19. Original footnote and location: Cürlis und Stephany: Irrwege unserer Baukunst (Cürlis and Stephany: Meanders of our Building Arts). 20. Taut uses the word ‘‘Nationalgedanke,’’ that is here translated as ‘‘national thought’’ based on the ethnic and ⁄ or cultural awareness of community. The German term is a fixed expression with a deeper meaning than that of the term ‘‘nationalism.’’ It must be viewed in the context of German history. Only after WWI, during the time of the Weimar Republic, were the different German states united through a democratic constitution to form one nation as a parliamentary democracy. 21. Here, Taut seems to refer to German classicism such as the works of Karl Friedrich Schinkel in Berlin and Leo von Klenze in Munich. 22. Rußwurm refers literally to the ‘‘Drill,’’ an extremely rigorous discipline for which the Prussian army was recognized. 23. Friedrich Nietzsche, ‘‘Schopenhauer als Erzieher’’ (1874). ‘‘Schopenhauer as Educator,’’ Schopenhauer as Educator, translated by J. W. Hillesheim and M. R. Simpson (Chicago: Henry Regnery Company ⁄ Gateway Editions, 1965). 24. Philipp A. Rappaport, Die Stellung der Staatsbauten im Stadtbilder, in Städtebau (Berlin: Wasmuth, 1913), a monthly magazine edited by Theodor Goecke and Camillo Sitte. 25. Taut summons his readers with this headline to clarify where they are standing. He uses a very old-fashioned term, ‘‘to raise a flag,’’ referring to a form of signal identification (esp. in wartime). At the same time, Taut uses the term ‘‘Fahne’’ or ‘‘flag’’ as a synonym for an idea, or a theoretical suggestion at the end of the text to describe a position or body of thought that architects will follow in the future. 26. Taut appears to refer to Karl Friedrich Schinkel’s national monument to the dead of the Napoleonic Wars. 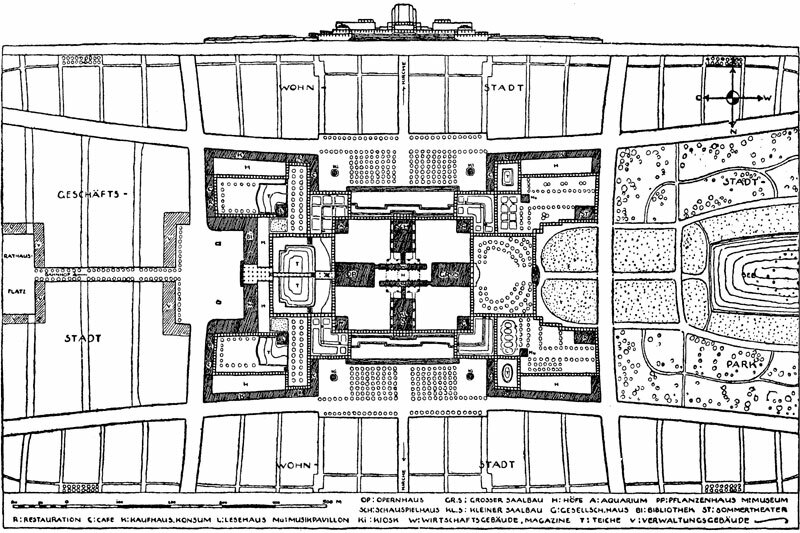 His original design from 1817 for the Tempelhofer Berg (today Berlin-Kreuzberg) resembled a Gothic cathedral. 27. Gustav Theodor Fechner, Die Tagesansicht gegenüber der Nachtansicht (Leipzig: Verlag Breitkopf und Härtel, 1879). 28. The original text speaks of ‘‘der soziale Gedanke’’ – literally translated ‘‘the social thought.’’ The word ‘‘socialism’’ has also been used to translate this phrase depending on the context of the expression in German. 29. Original footnote: ‘‘Es sei auf den neuerdings begründeten Volkshaus-Bund hingeweisen.’’ (It needs to be referred to the recently founded League of Community Halls). 30. The ‘‘Volksbühne’’ was erected with donations from the workers to allow ‘‘the small people’’ access to the theater or other cultural events. Oskar Kaufmann designed this first theater in modern style in Berlin, completed in 1914. Taut’s second example of the Diamond Worker Union House in The Hague most likely refers to the main building of the Algemeene Nederlandsche Diamantbewerkersbond (1897–1900) designed by Hendrik Petrus Berlage, which is located in Amsterdam and not in The Hague as he incorrectly notes. 31. The expression Taut uses is ‘‘lebendige Kunst’’ (the ‘‘living art’’), which refers to products of living artists but may also include installations, performances and more modern genres. Taut seems to refer to rotating exhibitions where the institutions themselves facilitate the showing of contemporary art but not necessarily their storage. 32. Taut’s term for the crown in the German text is actually ‘‘das Haus’’ (the house). 33. 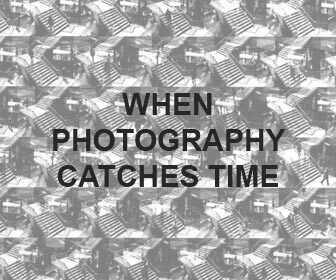 Taut speaks here of the ‘‘letzter Ausdruck’’ (the last expression) which refers to the dedication and creative power artists experience when they are absorbed into their work that pushes them beyond all expectations. 34. Original footnote: ‘‘Spruch Scheerbarts am Glashause zu Köln 1914’’ (An expression of Scheerbart on the Glass House in Cologne, 1914). 35. Gustav Landauer, Meister Eckharts mystische Schriften, in unsere Sprache übertragen (Berlin: K. Schnabel, 1903). Eckhart von Hochheim, also known as Meister Eckhart, was a medieval monk, philosopher, and assumed mystic. The publication of some of his writings in contemporary German by Landauer attracted much attention at the time and also influenced Taut’s thinking.